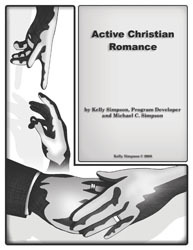 This curriculum takes a healthy look at romance, while allowing safety to discuss preferences, beliefs and attitudes. It takes a light-hearted path through important topics that assist couples in building or maintaining closeness, compassion, understanding and increased enthusiasm for one another. It is written from a Christian lens and includes Biblical Scripture and Prayer.